October 20, 2007: The 10th anniversary of Ron’s suicide, and because the boys are both off to college, the first anniversary I won’t see either of them. Yet the date seems significant, so I decide to drive up to the cemetery and spend some time alone with Ron. 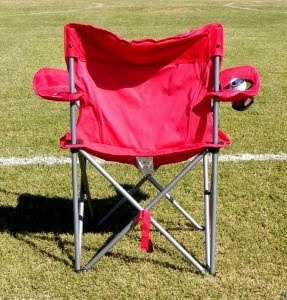 I take my folding chair from the car, the one I’ve taken to countless soccer games over the years. I'm more thankful than ever to be setting it up, once again, on the sidelines. I try to remember if I bought this chair before or after his death. This is how I divide the timeline of my life now—before, and after—but the division is getting as frayed as the edges of this chair. I sit down and flip through my 1997 journal, the one I was writing in at the time of his death. I am finally considering writing a memoir, but first I want to steep myself in the details of my life at the time. Some entries make me laugh, some bring instant tears. I pull out papers stuck into the notebook’s front pocket and leaf through them. Among them are copies of letters the boys wrote to Ron. Tears again, they are so touching—I decide to ask them if I could use them in the memoir. We’d read the originals aloud nine years ago, and burned them right here on his grave. I find a few printouts: an e-mail I’d sent to my friend Ellen on Valentine’s Day—the date stamp says it was eight months before Ron’s death—in which I admitted the sad truth that I could no longer connect to any romantic feelings for my husband. A “Virtual Flower Bouquet” Ellen sent to cheer me, just five days before Ron’s suicide, that says, “Don’t ever doubt that it’s right to believe in love, in yourself, and in the possibilities.” Another e-mail from Ellen written five days after his suicide, that begins, “I’m sitting here trying to imagine how it will feel for you—returning to your office, where although everything remains the same, somehow everything will undoubtedly feel different." Everything gains new meaning through the lens of hindsight. Then I find something that proves that even from beyond the grave Ron has the power to shock me: tucked into that same pocket, among the other papers, is a list. I haven’t seen that handwriting for ten years but I immediately know it to be Ron’s. Not the quick scrawl I’d find on a note left on the counter—“Animals all fed,” I’d eventually decipher—but the quirky mix of cursive and printing he’d use when attempting legibility. I do not recognize this list. I don’t know how it ended up in my journal. But it feels like a gift. 1. Withdraw from family life. 2. Don’t pull my own weight with Kathy and kids. 3. Ran up large CC bills, didn’t share with her. 4. Didn’t communicate with her. Didn’t listen to her, she has been worried and concerned for years. 5. Do fun things not just work. 6. Alcohol—When at home have 2–5 drinks in evening. Don’t seem to drink when not home. By the end of his life I did not believe Ron self-aware enough to make this kind of list. Yet of one thing I was sure: the last person to touch this piece of paper had been my husband. And as I sit here at his grave I feel he is reaching out to me across the years to tell me he was more aware than I thought. The list leaves me madly resorting facts and suppositions. Had I found this list before his death I would have seen in it a glimmer of hope: If you can identify problems, you can search for solutions. I guess this isn’t true of everyone. More about this mysterious list in my next post. A simple act of introspection resonates a decade later. That's a beautiful image, Kathryn. Thank you.